Spoiler alert: There's a whole lot more to the eatery than the decor. If there is one thing New York City does not lack, an abundance of Aussie cafes would probably be it. The influx of flat white and brekkie-serving hotspots have been popping up across the city and to great critical acclaim at that. Falling in line with the surge of the eating healthy and living well that’s swept the masses, said cafes have been bringing the best of Australia—decoratively and nutritionally—stateside. Charley St is the latest establishment to join the ranks but don’t be fooled, they’re not here to fill the standard mold. The self-proclaimed fast-casual hotspot is challenging the traditional with a unique POV that is fresh yet true to its roots. “I saw an area of the market wherein the Australian lifestyle is very exciting and likable. 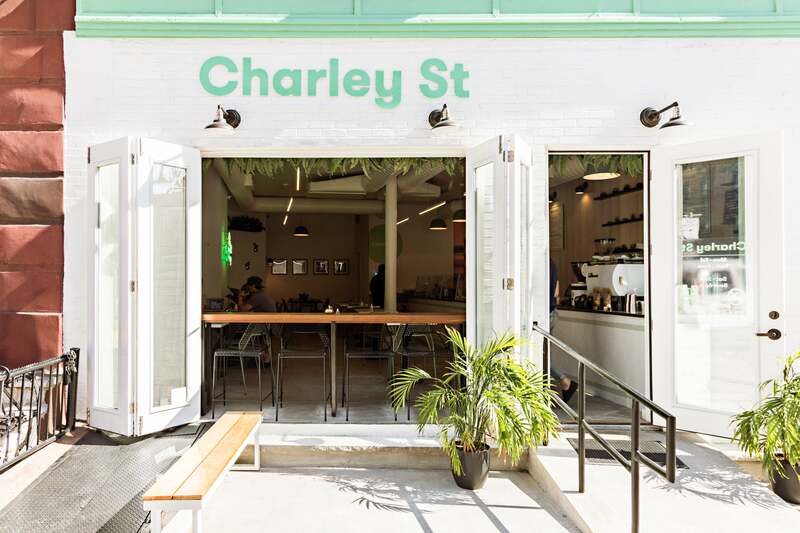 Delivering Aussie-inspired eats and quality coffee in NYC is a very attractive idea,” says Charley St co-founder Dan Churchill. And that is precisely what he did. Armed with the intention of skillfully merging the two, Churchill’s approach to the eatery was slightly different from that of his counterparts’. “Fast casual” was the primary descriptor of the endeavor, which would aim to bring together breakfast, brunch, and avocado toast. Truly, could we ask for anything more? Charley St’s facade is a welcome respite from its surrounding—its brilliant white exterior seamlessly translates inside, resulting in an all-encompassing finish that perfectly captures the highly-coveted Aussie-cool vibe. Simplicity may be at the core of the decorative personality of the eatery but we would hardly call any of it a compromise on style. The spanning line of floor-to-ceiling windows that comprise the entrance is the obvious focal point of Charley St, and one that allows for prime people-watching. Interior designer Liza Kuhn was the brains behind the pared-back yet impactful scheme, which was strategically designed to emulate the food itself. “The materials of the interior echo the plates of Charley St—white walls and tabletops are balanced by pops of color in the scattered greenery, brass accents, and mint penny tiles that clad the bar front and bathroom walls,” she says. An exposed brick wall sets the backdrop behind the seating area that comes paired with an abundance of hanging greens. The live-edge walnut tables (sourced from Brooklyn’s Sawkill Lumber) contribute to the organically-fueled aesthetic of the restaurant, falling in line with the warmth of the fresh and vibrant atmosphere. The beautifully designed dining area aside, the not-so-arguable star of the show there is the bathroom—and trust us when we say this, it’s not your average one. “Restrooms are exciting design opportunities—it’s inevitable that people will enter them, yet also a space where you might not expect to find a heavily-patterned, colorful graphic,” says Kuhn of her choice wallpaper selection. A little cheeky with a playful touch (coupled with an embodiment of the Charley St brand) was the prime criteria when it came to Kuhn’s search for the perfect backdrop for the bathroom. The result was a graphic avocado print wallpaper, which has naturally taken the social media world by storm. It’s safe to say that the food is yet another prime component of what makes the eatery as special as it is. According to Churchill, the menu was designed to mimic the colorful food movement—one, which in his words, has the ability to spark joy. Similar healthy influences can be found within the cafe’s array of offerings: the Down to Earth bowl comes chock full of essentials including; roasted eggplant, garlic hummus, wild rice, and mushroom ragu. All of the dishes are made fresh on a daily basis and feature a slew of ultra-healthy ingredients. Heading there for brunch? Order the Aussie Classic: an avocado and poached egg combo that’s served on either toast or per a grain bowl. That being said, don’t go searching for your standard avocado toast here—Charley St’s rendition features a walnut miso, pickled tomato and onions, and lemon zest for a revitalizing twist. Seasonality is an integral component of Charley St, and one that falls right in line with their steadfast promise to maintaining a fresh and wholesome approach. Nutrient-rich foods, locally-sourced produce, and a commitment to reducing waste stand in as the pillars of the brand’s ethos. You can count on finding vegetables at the base of every savory dish at Charley St coupled with repurposed elements that ensure the ultimate use of every ingredient. Cauliflower rice is made using the vegetable’s stems—that would otherwise be thrown out—while the banana bread can attribute its natural sweetness to the use of the sweet potato juice, reserved from the healthy hash on the menu. The foursome behind Charley St is a significant component of the cafe’s success. “The special thing about the Charley St is that each of us had something unique to bring to the table, derived from our own industries and unique skill sets,” says Churchill. Aaron Cook brings on the energy, in the most literal sense of the word—the coffee savant drew from his experience in the industry to bridge the gap between coffee culture and the collective perspective of it. Call Kieren Dwyer the “suit.” Focusing primarily on the cafe’s long-term growth Dwyer is the financial brains behind the operation. His counterpart, Kale Evans, is the one who handles the day-to-day operations, utilizing his background in hospitality to propel the brand—i.e. getting the place up and running in the first place. Last, but not least, there is Churchill himself, who is arguably the face of the brand, and naturally so. The chef closely aligns his passion for healthy eating with that of Charley St’s, integrating said philosophy into the cafe’s thoughtfully designed menu. As for what’s next? Churchill naturally has an array of exciting projects on the horizon—a subscription olive oil line whose proceeds will directly benefit City Harvest is one such example, while the other is an internally-focused project. “We’re building a studio kitchen below the restaurant to be able to work even more closely with our partners in producing content in-house, as well as to host demos and classes that benefit and engage with our community,” he adds. Visit Charley St at 41 Kenmare in NYC.